The sixties were a time of iconic creations on all fronts, from the birth of Marvel Comics, to the maiden voyage of the U.S.S. Enterprise, while on the big screen, a movie came along that changed the course of Science Fiction films. 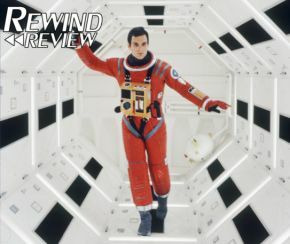 In this Rewind Review, we travel back to 1968 with 2001: A Space Odyssey. Based on the short story 'The Sentinel' by Arthur C. Clarke, 2001 tells the story of the Black Monolith, the evolution of humanity and the rise of the A.I. supercomputer known as HAL 9000 as a small craft travels to the planet Jupiter in the hope of finding extra-terrestrial life. The human lead character is Dave Bowman, played by Keir Dullea (Valley of the Gods). There’s only a brief idea of his backstory and where he comes from, but his performance is brilliant and he makes the character feel real, which is an amazing feat considering most of his scenes are dialogue free. The co-lead here is Gary Lockwood (Unbelievable!!!!!) as Dr. Frank Poole, who gets a bit more backstory, but played just as well. His interactions with his co-stars are great and he also manages to do well in the almost silent film. Lending his voice talents to the on-board artificial intelligence (A.I. ), HAL 9000, is the late Douglas Rain (Sleeper), who sadly passed away this year. He’s softly spoken and yet still maintains a slightly robotic voice. It’s subtly more frightening and relatable than the average villain today, which is only heightened by the emotions he can feel. The movie doesn’t really focus on any specific characters beyond the main three, instead it makes a point of maintaining the spectacle on screen with the characters acting as the eyes of the audience. On the surface, it’s a movie about mankind trying to find life, but it gets much deeper and explores how humanity has evolved from tool wielding monkeys into technologically advanced space travellers. It’s an intriguing plot that demands multiple viewings and doesn’t get watered down to explain everything. With this being visual story, it takes its time to progress the story forwards, sometimes a little too long, letting the astonishing imagery do all of the work. This may be a put off for some, but to the rest, it’s a realistic depiction of space travel, the like of which had never been seen before, and touches on so many aspects that have defined the science fiction genre, such as artificial intelligence and potential extra-terrestrial life. Speaking of the visuals, there truly are no words to describe what happens on screen. Every shot is beautifully created and always contains something to catch your attention. From the bending space station to the trippy flight through space and time, it is simply breath-taking. With the movie coming out in 1968, there wasn’t a lot of computer effects that they could use. This is easily the movie’s greatest strength, as the practical models and imagery makes everything seem much more realistic and still hold up extremely well. Even something as simple as a character walking through the space station then walking up the wall to the roof will leave you asking how they did that. It isn’t just the effects that looks great, the makeup in certain sequences are too. The earlier scenes involving the primates may be dated today, and very similar to Planet of the Apes (1968), but it’s an amazing scene nonetheless. 2001, isn’t just famous for its visuals, the music is just as iconic all on its own. Surprisingly, the original score by Alex North was unused, with Stanley Kubrick opting for classical music that was chosen as the “guide pieces”, such as the epic Zarathustra by Strauss. It’s a great selection of music and enhances the movie tenfold. There’s no denying that this film changed the way we view science fiction movies and TV. Odds are most people will have seen a parody or two that use the same music and most big budget sci-fi flicks nowadays are influenced by its visual style, such as Under the Skin (2013), Interstellar (2014), The Martian (2015) and of course, Star Wars (1977). Overall, this is a spectacular looking movie with incredible effects that will leave many viewers baffled at what they are seeing. It’s a movie that demands multiple viewings and will leave you asking thousands of questions. Purple Revolver rating: 4.5/5. A stunning experience.